For the highly motivated, it's possible to track down devices to measure energy consumption on the internet. To measure my own use, I bought a Kill-a-Watt, which is a $25 handheld device that will tell you what most plug-in appliances in your home are consuming at any moment or over a period of time. It's very helpful, but not for measuring the big consumers, like the central A/C, the dishwasher and clothes dryer. For those, I had to buy a $150 device that tells me how many watts my whole house is consuming at any moment. Though a number of home energy monitors are available on the internet, I ended up buying The Energy Detective--TED for short. Now I can turn on the dryer or any other item and see immediately how much my energy use jumps. I'm surprised how many people shrug at the notion that this sort of knowledge and instant feedback could have any impact on behavior. It certainly has changed mine, as another post will describe. Strangely, the realization need not lead to a burden of guilt but instead to a sense of empowerment. Each of us has the power to reduce our impact. The first thing to do is to discern when you're consuming fossil fuels and when you're not. This is not so easy, particularly around the house, where silent appliances can nonetheless be consuming large quantities of electricity. Unfortunately, your electric meter is of little use, since it's hard to read and located outside somewhere in the bushes. Not a convenient setup for providing feedback. A separate post will describe how to measure your energy use at any particular moment. I looked into getting solar panels for my home. The roof's oriented all wrong, and there are some big trees in the way. The solar rep, slow to yield to reality, suggested we put the panels in the backyard. What a lovely sight that would be, and a perfect target for soccer balls and various other errant airborne objects. That puts me in a group that includes most Princetonians, who by and large like the shade and don't have homes that will conveniently rotate to face south. After a few months of being discouraged, I realized that there are nonetheless large portions of my lifestyle that can be converted to solar power, without the substantial investment in solar panels. 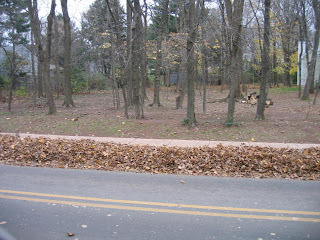 The previous post (below) tells why raking all your leaves to the curb is not such a great idea. There are lots of reasons to think of leaves as an asset rather than a burden. Here are some ways you can use leaves to advantage in your yard, whether it be large or small. 1. The simplest thing to do is rake/blow them into a woodlot, if available. 2. Rake them against the fenceline, where they can serve as a mulch to keep down weeds that often dominate along fencelines. Or dump them on any other weeds or groundcovers that are getting out of control. A thick layer of leaves discourages weeds. For weeds/groundcovers strong enough to push up through the leaves, first place overlapping pieces of cardboard on the undesired plants, then use the leaves over top to hide the cardboard. 3. Rake them into a leafpile. A corral or circle of wire fencing will help contain the leaves and keep them from blowing around. 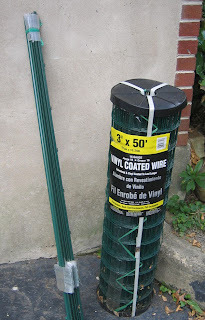 A readily available fencing is 3 feet high, green, and comes in rolls at the local hardware store. (Photo shows enough fencing for several corrals). The corral is essentially invisible when tucked in a back corner of the lot. A U-shape may be preferred so that leaves can be dragged, blown or raked right into the enclosure rather than lifted over the fencing. The leaf pile quickly reduces in size over the winter. The leaves can be left to decompose, acting like a sponge to catch the rain, and releasing nutrients to benefit the health of all trees and other landscaping in the vicinity. Contrary to popular notions of composting, it's not necessary to laboriously turn the pile. Just let it decompose over time. My experience is that a pile of leaves does not create odors. 4. Spread them on the vegetable garden and leave them there to hold in moisture, prevent weeds from sprouting, keep the soil cool in the summer, and slowly release nutrients. Planting tomatoes, for instance, requires nothing more than parting the leaves to put the new plants in. The leaf mulch reduces rotting of any tomotoes that touch the ground. 5. Mulch them up with a mower so they can disappear back into the lawn. The fragmented leaves can also be raked onto flower beds as a mulch. Some leaves, like those of silver maples, crinkle up and all but disappear into the lawn on their own, even before mowing. For thick, persistent leaves like those from a red oak, a corral or the mulch mower approach will keep them from blowing back into the yard. In response to a state law passed some time ago, Princeton Borough is no longer picking up grass clippings from the streets (http://www.princetonboro.org/public_works.cfm). Grass clippings clog drains and their nutrients can leach into local streams. The stormwater system underlying town streets feeds directly into streams, so dumping anything on the street is essentially the same as throwing it into the local brook. Some homeowners hold to the belief that grass clippings left on the lawn cause thatch buildup, but the Mercer County Extension service does not recommend removing them. They are high in beneficial nutrients and decompose quickly. They can also be composted if mixed with other organic materials. Go to http://www.mgofmc.org/successfullawncare.html for more info. Unfortunately, many homeowners, not having gotten any clear feedback from the borough, are still dumping grass clippings out on the streets, making ever larger piles. Maybe someday there will be a good feedback system developed so the policy is made clear to those who can't take a hint.